O'Malley (undisclosed) participated in Sunday's practice, Dan Duggan of The Athletic New York reports. Analysis: O'Malley was sidelined for Friday's preseason game against the Lions, but it looks like he is over whatever was bothering him. However, missing Friday's game still did not do any favors to O'Malley's chances of making the Giants' final roster. O'Malley (undisclosed) will not play in Friday's preseason game against the Lions. Analysis: O'Malley re-signed with the Giants on a one-year contract this offseason after appearing in one game for the club in 2017, He may be on the outside looking in regarding a 53-man roster spot out of camp, and an absence from preseason action doesn't help his cause. O'Malley signed a one-year contract with the Giants on Friday, Jason La Canfora of CBS Sports reports. 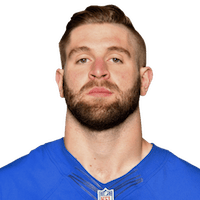 Analysis: O'Malley, who went undrafted out of Penn in 2016, signed with the Giants last December after spending the majority of his career on the Raiders' practice squad. He only appeared in one game for Big Blue, logging seven offensive snaps (but none on special teams) without seeing a target in the passing game. O'Malley will likely remain in a depth role entering the 2018 season. There are no videos available for Ryan O'Malley. Click here to view all videos.